As vice president of marketing for a major propane supplier, Bill Byrne was connected to the industry – not just through the pipelines that carried product to his customers but also to the committees, boards and government agencies that influenced businesses. It was his quiet, personable demeanor that allowed him to communicate effectively with the bobtail driver or the executive in the boardroom. And when issues arose that begged for direction, he had a special way to lend a hand – and a solution. Byrne, who spent 40 years with Tulsa, Okla.-based Warren Petroleum Co., believes his work with government agencies and the relationships he built with them and other key company officials helped define his career. 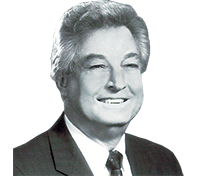 The National Propane Gas Association (NPGA) named Byrne the Bill Hill Award winner in 1992. The honor goes to a propane industry member who has contributed in public affairs at the national, state or local levels. “I had access to heads of most of these chairmen and presidents of producing companies,” says Byrne, 86, a graduate of Mississippi College and the University of Oklahoma who started working for Warren Petroleum in 1951. Byrne served in numerous sales roles across the country before becoming a vice president of Warren Petroleum, Chevron’s gas liquids division, in 1977. One of the more informed industry leaders on gas liquid supplies, Byrne was a regular speaker at industry events during the price control era of the 1970s. He spoke about the “propane dilemma” of the time – the control era’s impact on supply and how companies operated under new regulations. Byrne, a Tulsa resident, recalls his involvement in emergency winter meetings in Washington, D.C., as a propane industry representative, amid the threats of seasonal supply shortages. He also remembers meeting with attorneys general from high-use propane states who wanted to overtake propane businesses during a time of product shortages and rising prices. Byrne served as president in 1986-87 of what was then known as the National LP-Gas Association board of directors. He sought to get producing companies more involved in the association, and he recalls his work to improve the relationship between the national propane association and the Gas Processors Association. He was also known for publishing an annual analysis of the gas liquids business. “People always watched for that article and would use it to help plan their business on an annual basis,” says Dan Myers, former CEO of NPGA and an LP Gas Hall of Fame inductee. Before Squibb-Taylor’s Milford Therrell took steps to rally support for a propane industry checkoff program, Byrne used his producer connections in the 1980s to raise money voluntarily for advertising and promotions. But such an effort wasn’t sustainable, and it became apparent that congressional intervention was necessary. “So in the long run what happened was Milford took that experience and said we can’t do it on a voluntary effort,” Myers recalls. “He said we need to go to Congress, get a law passed and mandate that everyone join. It wouldn’t have happened if Bill hadn’t tried to get a program resurrected,” similar to a voluntary propane industry effort that had taken place in the 1950s. Byrne got behind Therrell’s push for a propane checkoff program, and it became a reality. The Propane Education and Research Act of 1996 allowed for the formation of the Propane Education & Research Council, which works on behalf of the industry in safety and training, research and development, and consumer education. “Guys like Bill Byrne were willing to step out and say this is where we ought to go – voluntary corporate enterprise – and if that didn’t work, let’s latch on to Milford and go all the way to the U.S. Congress,” Myers says. After Byrne retired from Warren Petroleum in 1992, he became principal of consulting company Byrne & Associates. He was elected to the boards of Heritage Propane, Energy Transfer Partners and Energy Transfer Equity. Bertelsmeyer, an LP Gas Hall of Famer, had long sought Byrne for the board position with Heritage.